Welcome to the closing lunch of the Hamburg Summit - China meets Europe! A special welcome to the Vice Prime Minister of the People's Republic of China, Mr. LIU He. We are deeply honored that you have come to Hamburg and are joining us for this closing lunch. And a warm welcome as well to European Commissioner Margrethe Vestager and Federal Minister Andreas Scheuer, two of our keynote speakers today. In Hamburg, this European-Chinese economic conference has found a most suitable site. Along with the European Union, the Free and Hanseatic City of Hamburg stands for a free trade and peaceful relations with all of the world. We are excited about the Chinese Belt-and-Road-Initiative to strengthen the links between Asia and Europe. The project has a great potential for multilateral trade and the world economy as a whole. Hamburg not only has one of the biggest ports in Europe, but is also a major European railway hub. There are already more than 30 trains per week between Hamburg and 27 Chinese cities. As the traditional hub between Europe and China over several centuries, we would like to be a strong partner in the Belt-and-Road strategy. The new Silk Route network is not a one way route - it creates new opportunities for the companies from all the countries that are involved. At the China International Import Expo in Shanghai this month, China indicated their interest in increasing imports. Our State Councillor Dr. Tabbara was there to represent our city at the opening ceremony with President Xi. Many companies from Hamburg went to Shanghai to advertise their businesses and returned with promising leads. Dear Vice Prime Minister, we are very proud welcoming you as the most important Chinese politician when it comes to economy and finance. Your visit to Hamburg is a strong signal for our business relations. 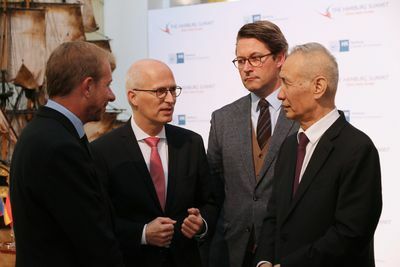 Over 500 Chinese companies have settled in our city and over 600 German companies are conducting their business in China from a Hamburg Branch. China and a Europe that is strong and stable can make for an excellent partnership. As much as we regret the forthcoming Brexit: Europe will be able to cope with Great Britain leaving the European Single Market and will remain as a strong advocate of multilateralism and free, regulations-based trade. And in this European Union, Hamburg will always remain a firm anchor for our good relations with China.